As we limp towards the finish line that is the Summer Holiday break in Australia, I am always surprised at the palpable acceleration of stress this time of year brings. It is hard to ignore unless you are clever like two of my siblings who have left town for most of December, taking their families with them. People shop hastily – as if there will be no retailers open for the next millennium – dragging along tired, worn out children who have peaked too early (how will they make it to Christmas Day?). I can almost hear the crescendo as the countdown to 25th December begins. This time of year unfortunately brings a few nutters to the surface. On Monday a lone gunman held seventeen people hostage in the Lindt Chocolate Café in Sydney’s Martin Place. The horror of this act against the backdrop of tinsel, baubles and other Christmas paraphernalia in the precinct will be remembered for a long time. As will the fatalities that occurred – a mother of three children, thirty eight years old, who was shielding a pregnant woman from gunfire when she herself was fatally shot. And the thirty four year old café manager who tried to wrest the gun from the perpetrator’s hands as he fought off sleep. This distraction gave six people an opportunity to escape. Many of us in this ‘Lucky Country’ are shocked that the sins of the world have reached our little quarter, our clean, hedonistic city with its perpetually shining sun. We are no longer an innocent, friendly holiday destination. For me, the other two major events in this week’s local headlines has put the Lindt Café incident in sober perspective: the storming of a school in Peshawar in North West Pakistan where one hundred and forty one people (mostly children) were shot dead; eight children found slain in a suburban home in Cairns, Queensland aged between eighteen months and fifteen years. There are nutters of a more benign variety living in my sleepy little suburb who also reveal their true colours at this time of year. Around the corner on Omaha Street there is a house with nary a brick left that doesn’t glow when the power switch is flicked at sunset (see photograph above). The front garden and ground floor of the family home are festooned with Christmas decorations, from a life sized nativity scene to an inflatable Santa. The result resembles the work of a crazy person, not some very eager Christmas loving locals (who maybe don’t know when to stop adding to their confection of colour and sparkle). I have watched this pantomime being constructed from the get-go over my ten years of living in the area. It takes six weeks to erect and the decorations when idle occupy the entire space of a double garage. ‘They’ are a Croatian Christian family who celebrate Easter with almost the same vigour, when the general theme is suffering, death and then resurrection, producing a more somber take on the fairytale-like light show. At my suggestion – given the amount of passing traffic that stops for a closer look – they now have a coin donation bucket for the Children’s Hospital. Their display always makes me smile when I pass their house to get to my street. I am thankful for their enthusiasm. 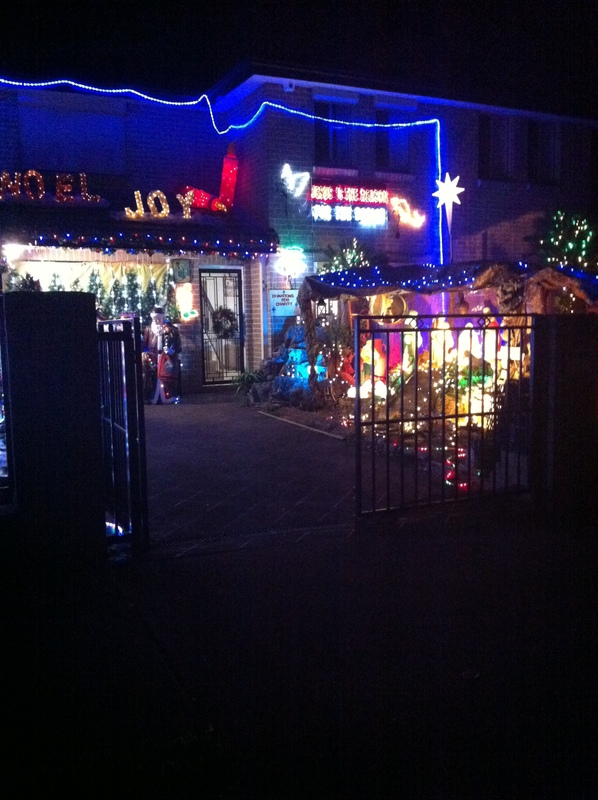 And hope their electricity bill isn’t too much (fortunately Christmas madness happens during the daylight saving period in Australia). This is serious decorating! Do they have a day job? Did they engage an electrician to help (or a project manager)? What about their electricity bill? Happy Christmas everyone, whatever that means for you.